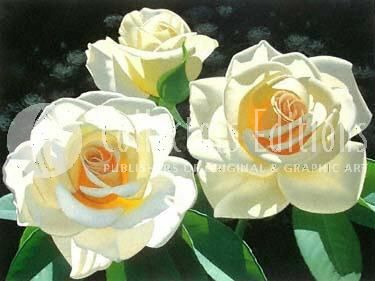 Brian Davis Limited Edition Giclee on Canvas:"Rose in the Shadows"
Title The Rose Trio Suite Edition: "Rose in the Shadows"
About the Art : "Initially, I liked the 20x20 format," Davis says, "and what that size suggests for an image. Different shaped canvases call for different works. Once I painted the first piece, �French Lace Aglow', the idea of doing two more struck. They're like portraits of different members of the �Rose' family." These stunning new portraits reveal the secret lives of flowers you only thought you knew. Davis has received much recognition for his intimate floral works, in a style reminiscent of Georgia O'Keefe. Davis' hallmark is his keen, masterful use of light and shadow. Each work displays the singular uniqueness of each flower - because, like snowflakes, no two are exactly alike. The portraits reveal deep complexities within each bloom that, to most people, are previously unknown and undiscovered. "The flower is the stage and the light is the dancer," he has been known to say. Davis' work can be found in permanent collections at the Los Angeles County Museum of Art, the New York Botanical Museum, and the Huntington Library Museum.